Beta Marine has enhanced its marine generator product range with the addition of Moteurs Baudouin engines to expand its offering to a global customer base. Gloucester UK based Beta Marine, which has over 30 years’ experience producing and marketing marine diesel propulsion engines and generating sets, has selected Proteum as its engine supplier. Marine Services company Proteum, is the UK & Ireland distributor for Moteurs Baudouin and a range of other marine diesel engines. 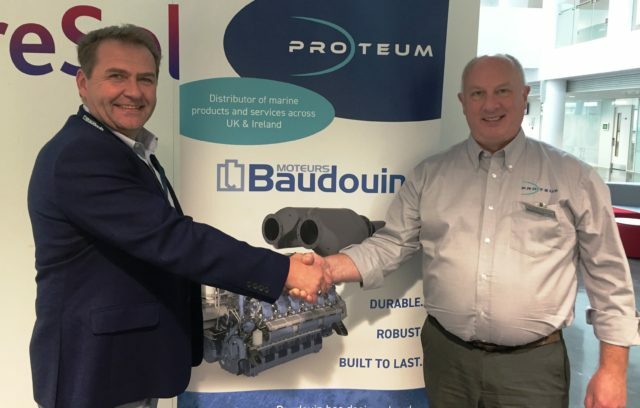 Proteum received its first order from Beta Marine in July for eight Baudouin 4W105S OEM auxiliary engines which have been delivered to a key export customer for four new build vessels. Beta Marine is offering Baudouin powered marine generating sets in varying kVA that are heat exchanger cooled as standard with keel and radiator cooling available as an alternative. “Baudouin’s engines are renowned for their reliability and low operational and through life costs and adding them to our marine generator range has already allowed us to meet a specific need from a customer. We have built a good relationship with Proteum who can support us both in terms of supply and with high quality technical services”, said Radus Lungu, Sales Manager, Beta Marine. Chris Lambert, Business Development Manager, Proteum, said, “Being selected by Beta Marine is a significant endorsement for both Proteum and Baudouin engines. Beta Marine’s reputation and global network open up new market opportunities for Baudouin’s marine generator sets”. Moteurs Baudouin has produced engines since 1918 serving the marine and industrial markets. Its products are distinguished by their genuine marine design, offering quality, adaptability and reliability. The production facility in Cassis, France, has Bureau Veritas ISO 9001 certification and their marine products have type approvals from most major marine classifications societies. They have developed advanced emissions technology and can offer IMO III and EPA IV compliance on some of their larger models.